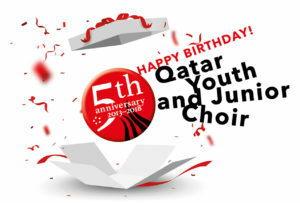 To celebrate its fifth birthday, Doha Youth & Junior choirs will be renamed Qatar Youth and Junior Choir. Choir Director Alena Pyne sees this change as a natural progression because of the choirs’ raised performance level and most importantly because these choirs travel abroad extensively and are great ambassadors for Qatar.They have undertaken four international tours in their short existence to Germany, Latvia, Croatia and Poland. The Youth Choir frequently performs with Qatar Philharmonic Orchestra and also with the adult Qatar Concert Choir. Pyne believes this change will raise the engagement level with other foreign high-performance choirs and will generate increased interest and involvement from the Qatar-based business community. Pyne has brought many choirs to Qatar for concerts and outreach workshops in schools across Doha, with the aim of helping to raise the general standard of choral singing and generate more interest in the choral singing art form. Such achievements are only possible with the practical support from our choir families and long-term partners Yamaha Fifty One East, Qatar Philharmonic Orchestra, Millennium Hotel Al Saad, Swiss International School Qatar, Germany Embassy Doha and earlier partners, the German International School Doha and Doha College. Last season culminated in the Youth Choir’s performance with Qatar Philharmonic Orchestra of the Qatar National Anthem at the grand opening of the Qatar National Library, for the Amir of Qatar, HH Sheikh Tamim Bin Hamad Al-Thani and his distinguished guests. The singers prepared so carefully and diligently for this performance, fully appreciating the great honour bestowed upon them.